Education: Ufa branch of the Moscow State University for the Humanities. 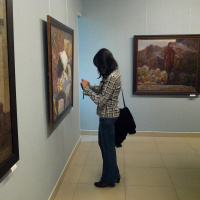 Sholokhov (UF MSUH), specialty "Fine Arts", 2014. The teacher is Sharipova Nelly Gumerovna. Direction in creativity: painting, graphics. Participation in exhibitions, competitions, olympiads: volunteer action "Memory Palette", Ufa branch of MGU after M.Sholokhov, 2014. She studied on the specialty "Fine Arts", qualification "Teacher of Fine Arts". At the moment, the main work is combined with the writing of paintings, I write pictures for the sake of self-realization, a search for something new in the world, for my spiritual development. Inspired by me, my dreams and just ideas coming from nowhere, suddenly a picture in front of my eyes. In the future, it's hard to say who I see myself, but I can definitely say that my creations will live and be born in my performance again and again.